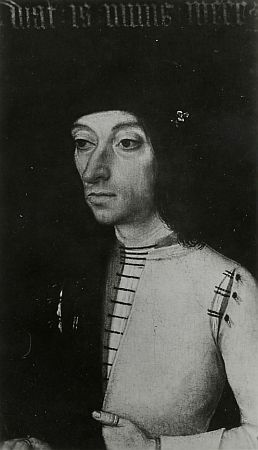 Most certainly it concerns Jan Bossaert, also mentioned in the genealogic Fund of Merghelynck in Ieper. 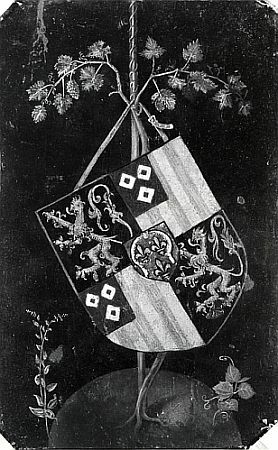 The reverse of the panel depicts the sitter's coat of arms. ( fl c. 1470-c. 1492). South Netherlandish painter. - the Portrait of a Young Man, recently identified as Jan Bossaert (ex-N. Mus., Poznan; priv. col.). These hieratic portraits are identically presented, the half-length figures being shown in three-quarter view to the left and against plain backgrounds. The relatively two-dimensional treatment of the torsos has a decorative quality and contrasts with the individuality of the faces. Their expressions conform to a standard type: heavy and constructed from planes, with long, prominent noses and a distant look in the wide-open eyes. The schematic handling of paint nonetheless appears meticulous: this is typical of late 15th-century Netherlandish painting and of Brussels in particular. The painted frame is an integral part of the composition. The reverse of each panel is painted with the sitter's coat of arms. The originality of these portraits lies in the obvious desire for realism, inspired perhaps by the strongly modelled portraits of Hugo van der Goes but transformed into a formula. - the portrait of the same sitter included in the triptych of the Marriage at Cana (c. 1492; Melbourne, N.G. Victoria).